Recorded: Live at Horizon, Chicago, IL, USA 19th September 1980. Comments: This bootleg has been out on other labels for some years. Wardour label claimed this release is an upgrade release of the concert. Looks like a nice release, with nice cover. Again has Wardour label put stickers on some copies, and added separate a dvdr with an audience film of a 1980 concert (part of the concert). One this release, they have a part of the concert at Civic Centre, St. Paul, MN, USA 14th September 1980. It's from a super 8 format. I'm not sure the quality on this film, but I guess it's ok since they claimed it's from the master reel. ★ Only the first 100 sheets will be released with a numbering sticker. ★ Only with the sticker with the first number "St. Paul 1980: super 8 master reel" will be attached specially. St. Paul, MN, USA 14th September 1980. "THE GAME TOUR" which won the 1st place in the United States in both albums and singles and has reached a great heyday. Ultra superfine recording representing the site brush up. It is a permanent preservation press appeared in 2CD. What is sucked in by this work is "Chicago performance on September 19, 1980". It is super superb audience recording that conveys the whole picture. Speaking of "THE GAME TOUR", while there are a large number of nominations that are suitable for the heyday, the sound that is suitable for that content is a rare toothy period. This work has healed craving of such maniacs, and it is one which updated the highest peak of the Daimyo board which was said as "LIVE KILLERS". It is a place to worry about that quality, but first of all it is the position of the show. Let's check from the whole image of the tour that fascinated the world. VHS "We Will Rock You" (1983), and in 2007 DVD, 2cd & 3lp "Rock Montreal"
This is the whole view of "THE GAME TOUR". This tour also has official work "QUEEN ROCK MONTREAL", but this work was a concert corresponding to 27 "North America # 2" performance which is more than one year ago even in the same North America. This work which recorded such a show, overwhelming audience recording anyway. 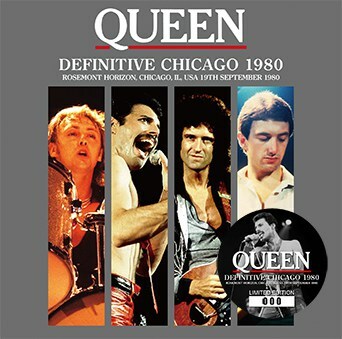 This week "DEFINITIVE CHICAGO 1978 (Wardour - 312)" will also be released at the same time, this work is also a collection of the same recordingists. Originally it was distributed as a separate masterpiece, but in recent years Maotami master unearthed at the same time. It turned out to be the same taper work. In fact, its quality is a tremendous going on "the sound board" on the ground, if the on-core leads a solid refreshing response and the modest weakness is beautiful, even if it approaches the deep power it does not bite at all. Of course, the details are also very fine, and the feeling of dynamics that the drum skin rebounds is transmitted. And amazing proximity. If you listen carefully with headphones, you can find the venue acoustics, but it is a level you do not want to find out. Besides that, even its sound is balanced like an official live album, it only stops giving exquisite gloss and dynamism to the sound board sound of the naked. Even such a performance sound alone is amazing, but even enthusiasm to convey further prosperity is beautiful. Although there is a scene where applause is very close, it is understood as audience recording, but the other applause is a stereoscopic feeling spreading to every corner of a wide venue. It is a stunning balance as if it was calculated and mixed, but its reality is unique to a customer record. One stroke one stroke, one voice one voice is delicate, and it gets smaller as it goes farther and becomes smaller. That perspective draws even a three-dimensional feeling. Although it became unexpectedly long in spite of too much wonderfulness, in fact this is a story of a previous episode. In our shop is the master we introduced in "THE ULTIMATE ENTERTAINER II". This work is a renewal master who has polished such ultimate Genie Direct by further up-to-date and meticulous mastering. There was no weakness in this recording as "DEFINITIVE CHICAGO 1978", but there was also an improvement point when reviewing still. A stereo feeling which was extremely crazy at the beginning 2 songs, a ringing of a hall where a slight amount of detail is clouded. Each one is a small one, but as a result of carefully preparing it, the coming out got better and the contour crisp and beautiful finished to a moment when one tone disappears. I was able to bring out the possibility that the name recording that had gathered acclaim from mania to the utmost was possible. What is drawn with such a sound is the splendor that it should be called the true price of the great prime "THE GAME TOUR". It is a bit different from the explosion tension that strikes the sky, but the sense of fulfillment and stability that is unique to the hedony is outstanding. Every song is a dignified performance that took the wind of success to the whole body, and the taste of singing down dynamism is also full marks. It is the stage of the champion full of confidence. 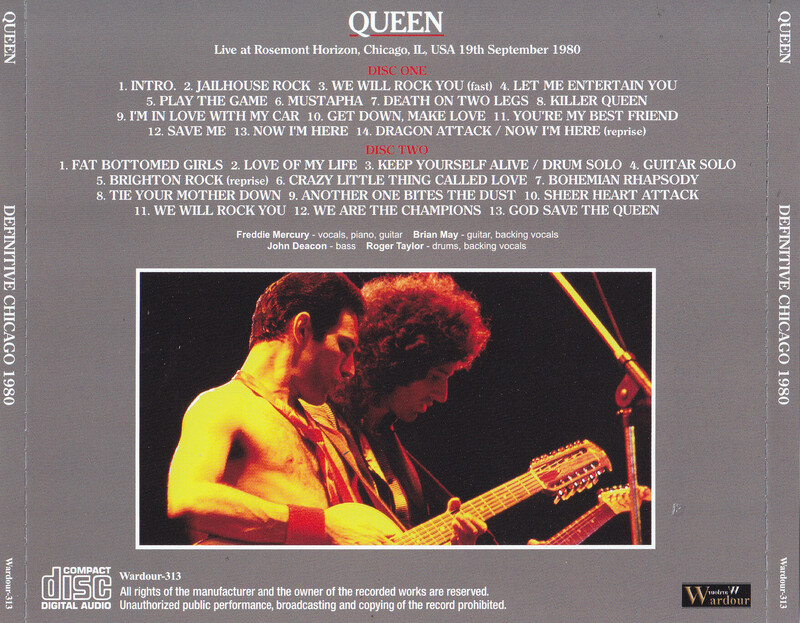 Moreover, there are plenty of songs that I could not listen in the official work "QUEEN ROCK MONTREAL". You can listen to "Mustapha" "Death On Two Legs" "You're My Best Friend" "Fat Bottomed Girls". In particular, "You're My Best Friend" is a number up to this "North America # 2", and there are also other "I'm In Love With My Car" and "Play The Game" "Save Me" You can enjoy plenty of masterpieces of the early 80's such as "Fat Bottomed Girls". It is a live album that you can witness the best sound on the scene where the glory of QUEEN history was sweeping across the country. Omoto master of legendary name recording, the highest peak updating board that draws out the possibility. Please, enjoy with the permanent preservation press 2CD as much as you want.